A Point of View offers an overwhelming sense of calm as you take in the partial Smoky Mountain views from your location perched on top of a hill. It’s a place to slow down, relax, and enjoy the serenity of the Smokies without the distractions of everyday life. 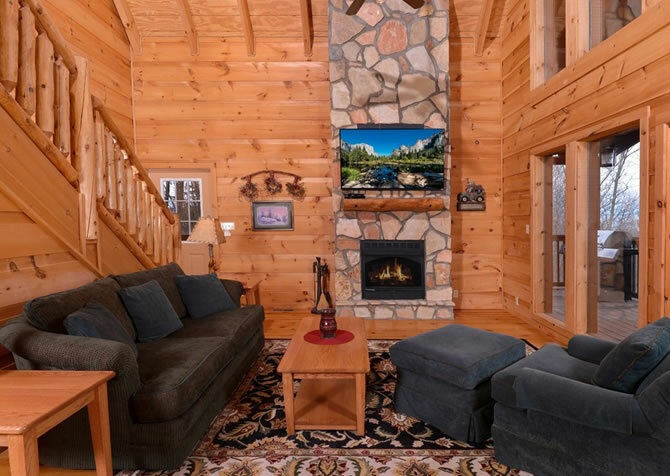 Get ready for beautiful architecture accompanied by breathtaking mountains from A Point of View like no other in this Pigeon Forge cabin. Built with architectural prowess, this Pigeon Forge cabin will show you the Smoky Mountains in the best way — from its point of view. 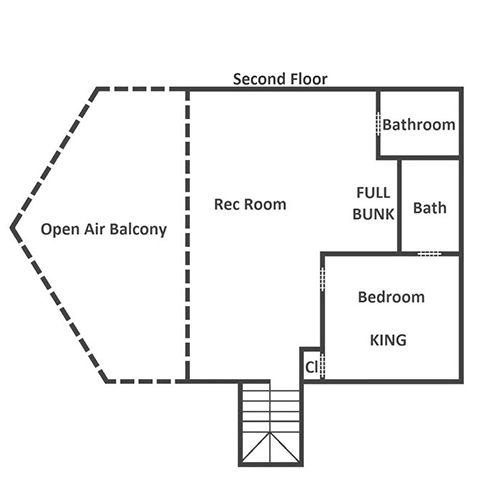 With 2 bedrooms, a loft, 3 full bathrooms, and 2 half baths, A Point of View sleeps 12 and provides impressive amenities, such as an electric fireplace in the master bathroom, arcade games in the loft area, and an indoor pool downstairs. By the end of your trip, you will see cabin fever in a whole new light! 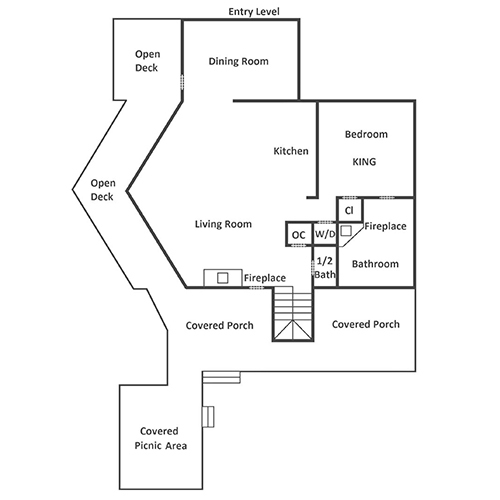 A Point of View beautifully blends form with function, offering entertainment, lovely design, and conveniences like a washer/dryer, gas and electric fireplaces, wireless internet, and a fully equipped kitchen where you’ll have the tools to create meals for groups. Plus, A Point of View is pet friendly, so you can forget about boarding or leaving your 4-legged friends at home. With multiple exposed beams overhead — including one bearing two fans and an antler chandelier —, large windows, and a big screen TV above a stone fireplace (gas), the living room is a great place to hang out, enjoy the views, and simply relax. Use the DVD player to watch your favorite movie while relaxing on the plump L-shaped sofa, have a seat on the rolled-arm bench while admiring the enchanting views, or throw out a deck of cards on the coffee table for some family fun. Whatever you choose, this living room has ample space for you and your loved ones to enjoy on your vacation. With an open floor plan, you can step right into the fully equipped kitchen just off the living room in a matter of moments. Featuring stainless-steel appliances — including a stove, dishwasher, refrigerator, microwave, toaster, blender, and a can opener — a spacious island with bar seating for 3, and plenty of counter space, this kitchen is more than prepared for all your cooking needs. It also comes handy with pots and pans, utensils — even a wine opener — drinkware, baking tools, and most importantly, a coffeemaker. Imagine coming out of your bedroom to the delightful scent of freshly baked muffins and hot coffee in the morning. Better yet, you can enjoy these tasty treats together at a breakfast table for 4 across from the main kitchen area. Don’t want to do the cooking? Stop by The Old Mill or Apple Barn for some fresh-baked goodies! Additionally, the island harbors the stove right in the center, allowing the partial mountain views to pour straight into the kitchen from the large living room windows, so you’ll actually want to cook here! Whip up meals as you chat with guests in the swivel bar stools at the breakfast bar. Close to the kitchen is a separate dining room featuring a beautifully crafted wood table accompanied by 6 chairs and a matching bench. Here, you and your family, friends, or coworkers can come together for delicious meals. Open the blinds to take in the outdoor scenery while you dine, and don’t forget to clear the table after dinner for some board games and playful banter. If board games aren’t your cup of tea, head on up to the loft for some arcade games instead. Featuring a wood-style pool table, a polished foosball table, and a fighting game for 2 — complete with joysticks — this rec room is truly a great hangout for all ages. There is even a full bunkbed and a queen-size pullout sofa so you will never have to leave! Turn the mounted TV on for some extra entertainment, check out the mountain views from the balcony area, or secretly spy on the rest of your family downstairs. With so many interesting things to do, boredom won’t be an issue here! Days hiking in the Great Smoky Mountains National Park, driving around Cades Cove, shopping at the outlets in Sevierville, and exploring the Parkway in Pigeon Forge can be exhausting. Treat yourself to a peaceful night in the cabin with the 2 lovely bedrooms in A Point of View. Climb into king-size beds to rest, read a book, or fall asleep to your favorite shows on the flatscreen TVs. Extra pillows, blankets, and throws in the dressers let you snuggle up as much as you want on those cool mountain nights. In the master suite, you’ll find a special treat for a spa-like experience. Step into the jetted tub to unwind in front of the remote-controlled electric fireplace! It’s the perfect way to end a night in the mountains. If you’re traveling with a bigger group than the 2 bedrooms sleep, A Point of View also offers 1 full bunk bed and 2 queen sleeper sofas for some extra space. Always a favorite in our Smoky Mountain cabins, a private indoor pool means you can swim year-round, rain, snow, or shine. At A Point of View, the heated private indoor pool features beautiful stone floor, playful sea life tiles in the pool (the kids will love diving down to them! ), custom lighting, and fun jets that spray across the pool. Hooks to hangs clothes and towels are a nice convenience, and seating – plus a flatscreen TV – means you can relax and enjoy a drink while others do a few laps or play around in the water. When you get to A Point of View, you’ll understand even more why they call it the Great Smoky Mountains. The partial mountain views from the wraparound porch are lovely, giving you places to breathe in that fresh mountain air on upper and lower decks. 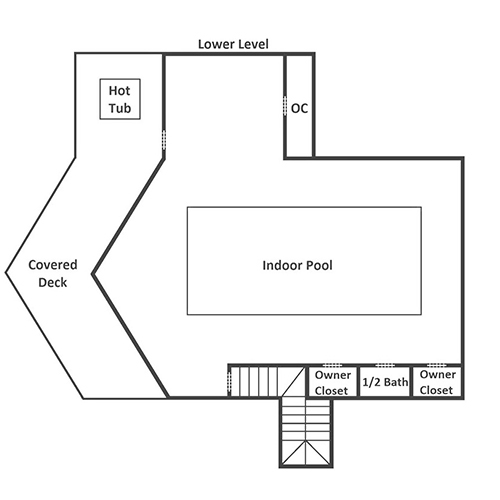 On the lower deck, climb into the hot tub to soothe tired muscles or have a romantic evening at the cabin. Grab a drink and sit back in the rocking chairs here, or head to the upper deck to awaken your senses with the breezes blowing in from the mountains or some rays of sunshine. In the covered picnic area, enjoy outdoor meals with gas and charcoal grills for burgers, steaks, and kabobs – even when it’s a bit rainy! Even arrivals are more pleasant here, with a flat, paved driveway with enough parking for 4. It makes it easy to park, head inside, and get your vacation started! On a quiet cul-de-sac, A Point of View gives you peace in the mountains. From plant life to little mountain critters, there is so much to see here. Slow down, connect with nature, and just let go. When you’re away from home, you don’t want to miss out on the conveniences you usually enjoy. Thankfully, A Point of View makes you feel right at home, starting with being pet friendly! You can stay connected with wireless internet in the cabin, pack light and take care of laundry with the washer/dryer in the cabin, and keep clothes looking fresh for nights on the town with the iron and ironing board. The Island in Pigeon Forge truly has it all: food, fun, and shopping. You can ride the Great Smoky Mountain Wheel, browse boutiques, eat at celebrity-owned restaurants, play The Escape Game, sip moonshine and listen to live music at Ole Smoky Moonshine, watch the show fountain dance, and more! Fly along the side of the mountain – at your own speed – for fresh air, unique fun, and an up-close look at the Smokies. It’s a great way to be “outdoorsy” when you’re done on the trails. This unique, touching, and immersive experience offers a hands-on look at history. Stand on sloping decks, touch an iceberg, pose on the Grand Staircase, and explore the ship with the boarding pass of an actual passenger or crew member! "We loved the cabin. We enjoyed the indoor pool as well as the hot tub. The ease of checking in and checking out was very nice. We will definitely be renting this cabin again!" Thank you so much for sharing! We are so happy you enjoyed your stay at A Point of View and with Cabins for YOU. We love to hear that our check-in/out process was easy and efficient. Thanks again for the great review and we look forward to serving YOU again! "We are staying at the Point of View cabin currently and could not be happier!! It is a beautiful cabin that has been well cared for!! We absolutely love the indoor pool and hot tub!! There are to many wonderful things for me to mention !! We plan on doing this again!!"